It’s not easy to get around Washington, DC. It’s really, really not! There’s ample evidence of this. Tune into WTOP for the regular traffic report -- “traffic on the eights, and when it breaks” -- and listen to the anchor with a thick mid-Atlantic accent recite a real-time litany of congested area highways. If you need more convincing, I present to you Exhibit B: An entire podcast, produced by WAMU, solely devoted to the chaotic commuting nightmare that is the Washington Metro system. It’s aptly named “Metropocalypse,” and it’s harrowing. Or just compare it to other cities. Last year, the Urban Mobility Institute named the city the nation’s most congested. So what should you do to get around the gridlock? A bike. Just get on a bike. It appears many Washingtonians agree with this sentiment. The number of residents who get around by bicycle has gradually inched up over the years, while the annual number of bicycle trips we’re taking around here has skyrocketed since 2000. Today, 4% of DC commuters do so by bike. Sounds like a little, but by headcount, that’s a lot. And that growing constituency is among the reasons the city government has built out its bike infrastructure. In fact, we’re in the midst of an expansion of the existing network right now. In 2000, there were less than three miles of bike lanes in the District. Today, DC maintains 69 miles of them. And more are coming. 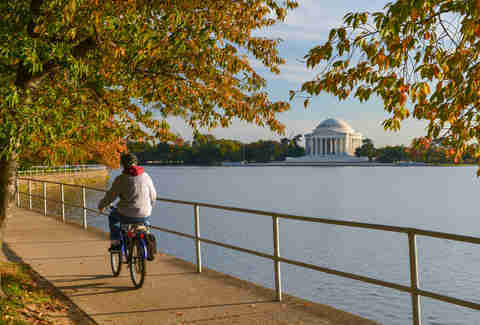 “Fifty-five to 59 percent of DC residents get around the city not in a car, which is pretty high, and the city has a goal to get that to 75 percent,” says Greg Billing, executive director of the Washington Area Bicyclist Association (WABA). Billing is referring to the city’s MoveDC program, which aims to get more of us out of our cars and onto buses, sidewalks, and bikes -- and by doing so, easing the gridlock. There are plans for pedestrians, and you can find them here. But the designs for the biking community are substantial. 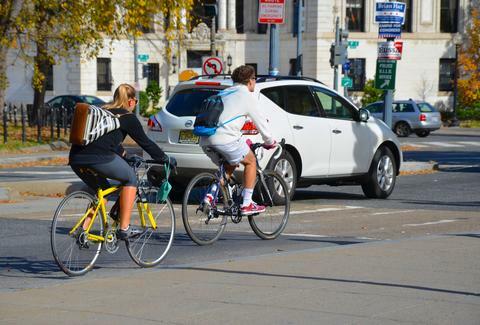 The city’s master plan calls for a total 136 miles of bike lanes by sometime around 2040. We’ll all be old and grey by then, but still, it’s all about the kids. Other than car congestion avoidance, there are a number of reasons you should be riding a bike around DC. It’s good for your health. Oh yes: It’s easy on the joints, builds muscle and bone, and improves your balance. So you’ll have your health going for you, which is always cool. And it’s certainly a great way to get to know the city -- and the people living in it. “When I moved into DC, being new and needing to meet friends, I found out about some social bike rides,” says Michelle Cleveland, who lives in Columbia Heights and works for WABA. “It seemed fun, like a cool thing to do on a Friday night, and I’d meet new people. You can get involved in this, too. But first, you’re gonna need a bike. There are a handful of co-ops in the DC area that offer bike maintenance and repair classes -- like the Bike House, which holds such clinics around town -- or can help you build your own bike from the ground up – like Gearin’ Up in Eckington in Northeast DC or Velocity across the Potomac in Del Ray, Alexandria. Once you’ve got wheels underneath you, there are around a dozen bike shops that host group rides. Talk to the people who work in these places. 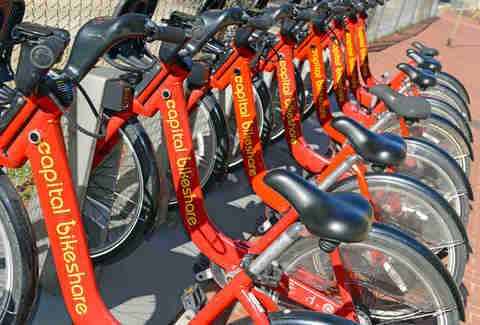 Among them are the Bike Rack, a shop with locations in Logan Circle and Brookland that holds a ride for beginners on Saturdays and intermediary and advanced rides that are longer on Sundays. There’s BicycleSPACE (locations Downtown, in Adams Morgan, and Ivy City), which regularly holds a number of different rides, including the Hills of Anacostia tour on Saturday mornings. That one will be a little more difficult. City Bikes, a long-established shop in Adams Morgan, hosts a ride through lovely Rock Creek Park every Thursday. You can give the popular DC Tweed Ride a shot. It’s once a year, and it only asks that you wear your finest Jazz Age raiment. And then there’s DC Bike Party, which is... well, exactly what it sounds like: A rolling monthly party, that begins with a big casually paced group ride, and often ends at a bar that’s prepared to play host to a lot of thirsty cyclists. Danny Lesh is its chief organizer. Lesh has been involved in the local Bike Party (there are others) since its inception in 2012. It’s traditionally held the second Wednesday of the month, and is occasionally centered around special events. The ride often pulls 100 cyclists, and many more when it’s warm out. Lesh says that beyond providing your own bike there’s a very low barrier to entry. Matthew McMullan is a writer who lives in Washington, DC. He grew up between the DC suburbs and the great state of Indiana. He commutes by bike, has a huge dog, and usually takes his shirt off as soon as he gets home from work. Follow him @mpmcmullan.